ARCHAEOLOGIST ANNA LEWIS has studied first contact with alien cultures in depth. Chiefly she wondered why we haven’t found an extraterrestrial intelligence in radio signals from the stars. Anna has a theory: if the human race is a latecomer among civilizations in our galaxy, then spacefaring beings might have visited Earth wayyy before humans developed. What were those little green men doing here? HER BIOLOGIST FRIEND SALLY believes they were infusing deep-buried microbes with their galactic DNA. Anna thinks this would have made us turn out a lot like them, so she decides to go looking for an alien mine shaft. THAT'S WHERE THINGS GO SIDEWAYS, because there’s an intelligent life form called a honey worm living in that deep shaft. As a species, honey worms live inside wormholes and their purpose is to stabilize the fabric of the universe. THIS RESULTS IN ANNA taking a ride to a planet on the other side of the galaxy, where she meets humanity’s cousins. It takes her a while to understand that she is part of a rescue project designed to save Earth’s people. IT LEAVES ANNA WITH A PROBLEM. The overwhelming knowledge she finds makes her wonder: will the world accept what she must tell them? Or will they kill her out of fear of The Other? THE TWO LEAD CHARACTERS are lifelong friends, ensnared in the evils of the patriarchy. 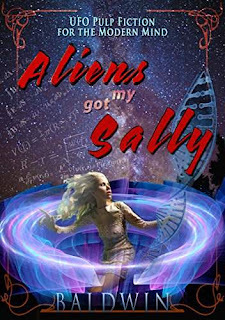 Because they must defeat the patriarchy for the human race to survive, Aliens Got My Sally is both science fiction and women’s fiction.